All about the furniture: A Split decision. Here are the spaces that I’ve pinned in my quest for the perfect shared office. I love this one as it has a subtle “man” and “woman” sides. And of course, those windows …………………….. !!!!! Another tandem. This time from Birch and Bird. Hop over to the original post – there are more pictures of shared spaces. If you are not fortunate enough to have windows, just line up the desks against the wall and use the extra space for your goodies. Click on the link to see some more spaces from the original post. Suppose you can say that my “all about the furniture” post was about double desks but to me it was all about my husband ……………………….. NOW, please don’t tell him that he got filed away with my furniture! Here you can have a look at our shared space. He decided on everything except 2 items ………………. if you can guess what’s mine, leave me a comment. I love to hear and see what you think and do. Thank you for looking at shared spaces with me today. Please check back as my fellow contributors and I have lots and lots more to share right here on Craft Storage Ideas. Have a great day! Author Hazel HammanPosted on January 22, 2014 January 20, 2014 Categories All About the FurnitureTags craft room, dining room craft space, ikea, shared space, studio4 Comments on All about the furniture: A Split decision. Hallo, it’s Hazel and I’m here to share the Crafter’s Caddy that I recently bought. I work all around the house – the office, the dining room table, a desk in the middle of our living room or my Craft Closet …………………….. wherever my family members are, I go!! This means that I have a “mobile crafting system” and I recently added another item: Creative Options Crafter’s Caddy. The Craft Caddy is available in two color palettes: the French Garden palette and the Viva Le Pink palette. The French Garden version has a bright magenta base with an avocado green drawer, perfect for refreshing any craft room. The Viva Le Pink version has a black sparkle base with a platinum drawer, for a timeless look that appeals to anyone. Both versions feature the same compact design and measure 12.88 x 8 x 6.75” for portability. It was readily available (even down under in Sunny SA) and rather “affordable”. I really love the tray that slides out as I’m currently into staples, stitching and paperclips. More than enough space for all of that. And here is a picture of what my caddy looked like two weeks ago ………………………………..
That’s it! Another addition to my “mobile crafting system”. 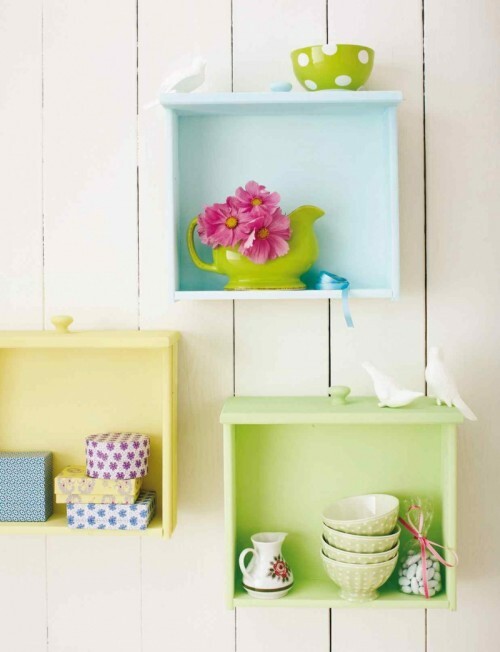 Thanks for looking at Craft Storage Ideas today and please check back as we have lots more to share right here. Today’s craft room was an unexpected, but very welcomed find! I was originally checking out this die, which combines the use of a card and a gift sack to make one awesome present for someone! Laurie of Soapbox Creations must be the brainchild behind the Card Hanger Die, and it’s so popular, it’s currently sold out! In any case, she has a lovely room that I want to share with you. As you can see by the photo above, she has everything neatly stored and organized with her “go-to” supplies situated where they are nice and handy! The ribbon shelf was made by her father, modifying instructions she found on Nichole Heady’s blog. Another smaller table holds her stamp pads, Copic Markers, and her Big Shot cutter. Hi all! Great to “see” you and I hope you will join me in welcoming our new Contributors this month! 🙂 You are all stuck with me for another term, I just love writing for this blog too much. It’s also helping keep me organized in my own space too, which is AWESOME! Today I have a fab room to show you! And it’s not even blue, aren’t you proud of me for branching out into other colors? Ok, ok… there is *some* blue in Kelsey’s room. I love that Kelsey struggles with something I do as well, which is a craft room in plain sight! No door to shut when we get messy (which for me, is quite often!) 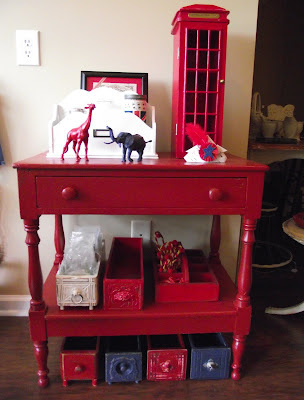 She turned her dining room into a craft area, and it is really lovely. Want to see? Here we go…. I love that the room already has a tile floor as tile is so user friendly for crafters, easy to clean! The soft beige on the walls marries well with the elegant columns on the perimeter of the room, I love that Kelsey has a few pops of color with the blue base on her worktable, and the blue scissors on the wall, but she’s kept everything very elegant feeling, like the frame around the magnetic board. Plus, this girl even knows how to make a pegboard look classy! I don’t know if Kelsey built her desk, but it looks as if she did, and it’s just lovely to boot. She uses simple jars for storing smaller items. I just love the rustic elegance that all of Kelsey’s room exhibits. hope you enjoyed it, too! Have a wonderful day! Hi! It’s Nicky again! Where was I? Oh – spinning racks! After a lot of begging and pleading my Dad made me this really cool spinning rack to store my Stickles, Liquid Pearls and Perfect Pearls. As you can see, it fits a lot of them on there and I just love how I can just spin it around to find what I’m looking for! Under the laptop desk I keep all the dies and embossing folders on the top shelf and my Big Shot, large die folders and a couple of bags on the bottom. I found these DVD storage boxes at my local discount store and knew as soon as I saw them that they would be perfect to store all the dies in! I’ve spent a lot of time working through all my dies and organising them into a way that would be best for me to find them. First I got some CD cases from my local discount store then some adhesive magnet sheets from Officeworks as well as copy paper in shades of purple and green. After trimming the paper down to size I used my score board to score fold lines to fit into the CD cases then stuck a square or rectangle piece of magnet that was big enough to hold the dies to the inside. The next step was the front of the covers. I took advantage of my two eldest nephews for this one! They would contact me and ask to spend time with me so I’d say sure but can you help me out in my scrap room? When they arrived I’d set them to work cutting each die onto the black or white paper. (Thanks so much John and Jordan, you were a big help!). Then all I needed to do was stick the shapes to the front cover. I have one more step to go for this project and that is to get my Dymo out and make up name labels for each die and stick it to the front cover. Over in the corner is my Expedit unit which stores most of my goodies in it! At the top of the unit is a pretty white cabinet that my Mum gave me a few years ago. She used it in her bathroom to store her perfumes in at one stage and I had always liked it so was pretty excited when it came my way. When I started setting up my scrap room I really wanted to use it for something so added it and since then it has held quite a few different items. These days it holds all my washi tapes in the cupboard part on cute racks that I got online and the two drawers are where I keep all my string which are separated by colour in 5 little plastic containers. To the left of this is a box that I made when I first started scrapping. I keep USB’s, cords for my phone and iPod and SD cards inside and on top sits the charging pad for my phone. Next to this is a cute china bowl that used to belong to my great-grandmother. I usually put little bits and pieces that I can’t be bothered putting away in the bowl until I do a big room clean up. The cute picture that you can see to the left is something that I made around 2 years ago using a blank canvas, some paint, a few pieces of paper and some ribbon. It’s so nice and bright in my room! In the Expedit unit I store the majority of the main items that I use for scrapping. In the top two shelves are containers that hold my brads, doilies and flowers. The next shelf down is where I keep all the paper pads. Then we have pearls and rhinestones, wood flourishes and the two boxes that I keep all the cards I make in and all the envelopes, card packs and cellophane bags for card making. On the bottom shelf are the die cuts and journal tags and a container full of all different kinds of embellishments. All of the plastic containers are the same size and all have lids. I found them at my local Spotlight store and they were quite a good price. I can fit two containers into one square of my unit. These have become so handy for me as I create as I can just pull the container that I need out and go through it on my desk then when I find what I need for my project I just put the container away with no mess to clean up. To the left of the Expedit unit is my paper rack. I spent a few hours a couple of months ago making labels for my rack and organising my paper via manufacturer although there are a few rows that contain papers that are just one offs. And last but not least I have my cute Chistery soft toy guarding over the Expedit! He came home with me when we saw Wicked here in Adelaide and has kept my company in my scrap room ever since. I have to admit, I adore flowers! There are so many pretty flowers out there and I am quite a fan of paper roses, Manor House Flowers and Prima Flowers! I haven’t stopped there though, in total I have 6 of these containers and they are all full of flowers from flat paper flowers to fabric flowers to beautiful paper roses – I have them all! Most of the containers are organised via colour but I have two that are organised via manufacturer so that I could keep them all together – the Manor House and Prima are in these containers. Keeping them together via colour has been the best way for me to store them all. When making a layout or card if I want to add flowers I am usually pretty sure of the colour I’d like to add so now all I need to do is pull out that particular container and pick which one I want to use. This is another part of my room that is a favourite feature for me. On the left is my inspiration board where I keep some of the photos that I’d like to use for a layout. I find this a really good way to plan layouts as I can see the photo that I want to use and being it is in my sight it stays in my mind. There have been plenty of light bulb moments for me where I’ve been sitting down watching tv and suddenly thought up a layout so headed into my room to pick the photo that will be used for it. I also like the way the board brightens up the room! On the right side of the wall is a whiteboard where I keep track of my To-Do list. Like my inspiration board, this is something that I am looking at all the time so that I know what I need to do and to keep track of my priorities. I don’t really like working with To-Do lists these days so this one keeps track of the projects that I need to finish so the rest of the time in my room is spent making whatever I like. Against the wall is my sewing machine and cupboard. I inherited the machine from my Mum and mostly use it to sew on my layouts or to mend clothes. I do plan to use it more along the way, it’s just a little overwhelming at the moment so I want to take time to get used to it and work out all the features before I get started. This is my sewing cabinet and as far as my scrap room project goes this is the biggest bargain that I’ve found along the way. As you can see by the photo above it looks like a small cabinet. Below is what it looks like fully opened, isn’t it amazing! I recall at the time I was trying to work out what to get for my sewing machine that I had googled ‘sewing cabinet’ so many times with no luck that I was ready to give up and just put it on the back burner. I really wanted to find something to keep my machine on but also something useful but not too big so that I could fit it in my room. I googled one last time and found this amazing cabinet on Gumtree which is an Australian buy, sell, trade site. And it was only $50! I got my measuring tape out and worked out that it would fit perfect in the room so I called the lady up and asked if I could come take a look with intent to buy. We arrived at her house that next weekend and I knew as soon as her husband opened it up that it would be coming home with us. I like how it all fits in snug to look like a little cupboard and how it has a little space inside that has a drawer and a little storage space. I keep my sewing boxes in there. The bonus part of the cabinet is that I can also use the pull out desk in front to take photos of my layouts and cards for my blog. We’re at the last part of my room now and I hope that you are all still with me! This is a bookshelf that was part of Mum’s quilting room. The other main area to store all my goodies! On the top of the bookshelf is where the sewing basket that Mum made me is kept and my cute bunny likes to sit on top. Next to that is a jar that I keep all the sewing threads in. These also came from Mum’s sewing room and I really love looking at all the different colours and how bright they are. Next to the jar is another layout stand and this one has a layout I made of Mum showing my 4-year-old niece how to sew. Another favourite of mine! The box that you can see on the end of the bookshelf is one that has 3 racks that sit on top of each other inside and is full of metal embellishments and trinkets that I plan to use on projects along the way. The photos and elephant trinkets at the front of these items are also from Mum’s quilting room. She collected elephants for years and I wanted to bring a few of them into the room with me. On the top shelf in the first cube I keep ribbons, my Magnolia Ink magazine collection and mini albums that I have made along the way. The next cube holds a large desk organiser that I made a few years ago and fits Glimmer mists, Big Shot cutting pads, measuring tape, stapler, ruler, etc. On the last cube I have two boxes that have a special mini album that I have made in each and on top is a cute sewing box that I gave to Mum a few years ago that has now come back to be a part of the room. I keep my sewing needles and a few threads in here so that they are easy to find when I want to hand stitch on a layout or card. The next shelf down in the first cube has the rest of the ribbon, lace and a folder that I store all my tags in. There is another folder in there too and I plan on putting the lists of all my scrap room products in there when I finish that project. On top of the ribbons and lace are other albums I have made. In the next two cubes are all of my stamp folders, ink sponges and my Smash books and journals. Here is a quick peek at what my ribbon and lace storage drawers look like. I purchased them from Kmart and the dolly pegs from my local discount store and all up I think after around 4-5 visits and some 20+ packets of dolly pegs I had enough to finish the project with! These items are all sorted via colours and have labels so that I can find what I need without having to go through them all. These are the folders that all my stamps are stored in. When organising this project I wanted to make sure that I kept with my colour scheme so decided to buy the folders in the same colour and add a touch of the other colours to them. I made the labels with my Silhouette machine and made sure to make a few extra in case I needed to add more folders. The labels were then put through my printer so that I knew what folder had which stamps in it. The folders are organised by manufacturer and there are two that have various stamps from several manufacturers in them as there weren’t enough of them to warrant their own folder and I didn’t want to get too overwhelmed with folders. This is what the inside of each stamp folder looks like. As you open the folder you can see the paper in the plastic sleeve on the right (I have moved it for this photo so you can see the whole of the inside together). On each page is the stamped image and the name of the stamp. Under each page is a stamp panel that holds the stamps that are showing on the page. I found this idea on a blog somewhere in cyberspace and am so glad I did as it is such a great storage idea. Before I started this project my stamps took up 2 cubes of my Expedit unit and were still in their original packaging which was quite annoying to manage when stamping lots of different images and finding the one I wanted was a nightmare! The other good thing about this storage idea is when my friends and I share our stamps. I just have to pull the folder out and they can flip through and see which images they want to add to their collection. They can stamp away and when they’re done just clean the stamp and put it back onto the panel. Saves a lot of time when there’s no packaging that’s for sure! A tip I have for managing my stamps is that I don’t add them to the folder until I have added them to my spreadsheet. Once I’ve done that they stay on my desk until I have made a label with the name of the stamp and stamped the image onto the sheet of paper in the folder. Then they can be put away. It may seem like a lot of work but trust me, it’s worth the effort to have a nice organised folder and if you’re like me and like stamps then it stops you from buying the same stamp twice! And finally – the last two shelves which have paper holders and plastic containers stored in them. At the top in the left cube is where I store my score board, kits that I have purchased as well as alphas and Thickers. In the next cube I have all the Kaisercraft collections that I mentioned at the start of the post. Alongside them is an expanding folder that holds templates for misting. In the last cube from left to right in the paper holders is chipboard, tags and acetate then coloured cardstock, black/white and kraft cardstock and in the last holder is all my Tim Holtz paper products. Next to them are 12” Kaisercraft paper pads. The plastic 12” containers at the bottom shelf are where I store all my current projects. I usually have a few projects on the go at any given time from off the page projects that take a lot of time to other small projects like a mini album or layouts. When organising these projects I usually have a good idea of what items I want to use so go through my room and take them all out and put them into the container. When I want to work on a particular project I pull the container out, put it on my desk and it stays there until I am either finished the project or if I run out of time I just put it back on the shelf. As soon as I have finished a project any leftover items go back to where they belong and I start organising the next project for the container. The last item I wanted to share with you today is labels. I have found through all of the projects for my scrap room storage that labels are one of the most important things that should be added. I think this because not only does it make it easier for you to find what you are looking for but it will also be easier for someone else to find something. I am at the stage now where I can be in a shop and call my boyfriend, direct him into a particular part of the room, tell him to look for the box in that area that has a particular label on it and he can see what I’m looking for. It’s also good if I have my scrap buddy over and she is after something. I just point her in the right direction and she finds what she needs in no time! I think labels are a good idea for any type of room as you should be looking for an item and getting back to what you’re creating and not spending so much time trying to find things! I didn’t have a set budget to organise my room as I had a bit of money saved in my bank account that I can use for things like this. When buying items for my room I didn’t have the ‘money is no issue’ attitude as I still wanted to save as much money as possible and focus on buying smart and ensuring that what I bought would be used and that each item would last a long time. My greatest challenge was going through my room regularly and making sure that there was nothing in the room that I wasn’t using, that I hadn’t used for a while, that I had bought with good intent and not used or that I did not need. I have learnt to be quite brutal with myself when shopping for scrap products or else I’ll buy things that are cute but won’t ever be used. It’s so important to have an organised space and not to fill it up with items that seemed like a good idea at the time. No, I’m an “organise it regularly” kind of girl! My room changes every few months and at times I have to move things around to accommodate this. It doesn’t take long for things to grow in your craft room and this happens to me often. I have a large collection of Magnolia and Gorjuss stamps among other types so that means when one folder is full then I have to add another and make space for it. What started out as two folders in a cube on my bookshelf has now grown into 13 folders on two cubes! My storage solutions are constantly evolving. When I have too many of similar items and they’ve outgrown their current box or shelf then I move everything around to make it easier to keep them all together. On that note, that’s enough from me. I hope you all made it through to the end of the post and that you got some good ideas for your own room. I don’t believe I’m an expert in organising but I have definitely learnt a lot about making things easier to store so if you have any questions about my room or anything to do with storage then feel free to send me an email (auntiecole@gmail.com) – I’d love to hear from you! If you’d like to check out my blog for other ideas I have put together along the way you can find it here. Thanks again for taking the time to check out my Scraptopia and thanks to the ladies at Craft Storage Ideas for the privilege of sharing it with you all! Here’s a super loud thank you to Nicky for sharing her space and organizing ideas! Did you see something you’d like to implement into your own craft space? Share with us! Happy Thursday! Today we are so happy to welcome Nicky to the blog. Nicky lives in Adelaide, South Australia, started scrapbooking about three years ago and is willing to try anything related to the craft whether it be layouts, cards, off the page, altered items, mini albums, colouring with copic markers and her latest addiction – Smash books! 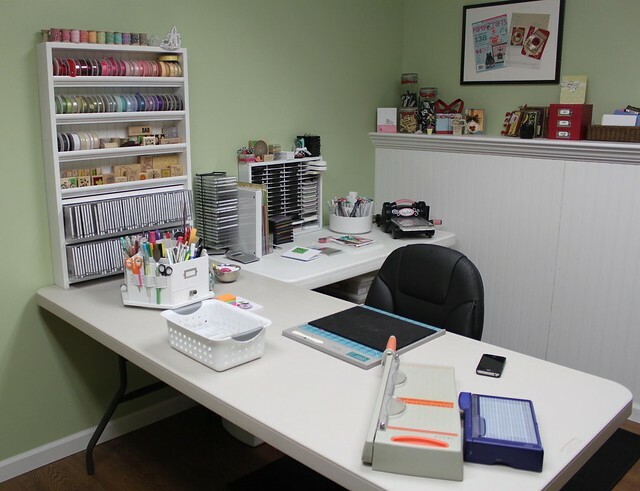 Nicky’s craft room is amazing, and she has so many fun details to share she’ll actually be back tomorrow as well! Let’s give her a warm welcome! Hi my name is Nicky and I’ve been following the Craft Storage Ideas blog for around 18 months now so first I’d love to say a big thank you to the girls on the blog and everyone who has contributed to the blog along the way as I have been given such great inspiration from you all and without you I couldn’t have made my room what it is today. Which leads to the reason that I am here with you today…. Welcome to my Scraptopia! I have spent a lot of time over the past 9 months organising all the bits and pieces in the room and am so pleased to be able to share it with you all now! My room is located in the middle of the house and is an open area that would normally be used as a second lounge room or as my darling boyfriend likes to remind me, a perfect place for a pool table! But he has his music room so it’s only fair that the space is used for my scrap room. It is around 4.1 x 4 metres and has a nice big window that lets in lots of natural light. The room isn’t enclosed as it only has the 3 walls and is part of the hallway as you walk through the house so I had a bit of a challenge when I set it up to start with. I must have moved all my furniture around at least 4 or 5 times before I settled on the current set up! I’m glad I did as I am quite happy with it and really enjoy the space that I have in here. In my room you will find A LOT of product as I have saved my money and carefully thought through the items that I must have for my craft as well as lots of other impulse items. I was quite a fan of the Kaisercraft brand when I first started scrapbooking so have most of their collections and accessories from their first releases up until around 4 months ago. I am also a huge fan of Teresa Collins, Graphic 45, October Afternoon, My Mind’s Eye and most recently have started collecting monthly kits from local Australian stores that contain a selection of papers and embellishments to match. Lately I have jumped in to the Smash Book phase of my craft so my room contains a lot of different embellishments, tapes, buttons and collectibles that work well with layouts, cards and my Smash Books. The other features of my room that you’ll notice are items that belonged to my Mum. She lost her battle with ovarian cancer 16 months ago and I have some of her items in my room to add that extra little bit of pretty and also so that I have little pieces of her near me when I create. I have organised the items in my room physically and also recently created a spreadsheet to document them and help me manage them better. I still have a lot of work to go with it but basically I have created a tab for each type (eg. a tab for Stamps, Paper Pads, Dies, Embossing Folders, Inks, etc). I plan on using snippets of time along the way to go through my room from one end to the other and note down everything I have in my room. I am doing this mainly for insurance purposes so that I have the right amount listed for the room ‘just in case’ but also to stop me from buying the same item twice! The reason I created it in excel is because I can email the list to my email account and view the file on my phone. So if I am at a scrap store and I can’t remember if I have already purchased a particular item then I can check the spreadsheet and go from there. I have also started a habit in the past few months where I put items I have just purchased on my desk next to my laptop and they stay there until I have time to update the spreadsheet. Once I have they can be put away where they belong. Once I have been through my room and added everything into my spreadsheet all I will need to do is maintain it and keep the updated version on my phone. It’s a lot of work but will be worth it in the end. I have trawled many blogs over the past few years searching for storage and organisation tips and added a lot of these ideas to my room. I have spent a lot of time thinking through different ideas for my scrap room storage and in some cases, tried a few different options before settling. I prefer to have everything organised in the relevant product type in the one location and if possible, in a box or container of some kind so that when I need to use a product on one of my projects I can pull it out and put it next to me on my desk to go through and work out what I’ll use. Once I’m done the box goes back to where it belongs. When I started my ‘Operation Scrap Room Utopia’ project around 9 months ago the first thing I did was work out the colour scheme that I wanted. I have always liked damask patterns so decided my theme would be black and white, damask and a touch of purple which is my favourite colour. After months of mini projects, making lots of labels and going to so many different places to purchase boxes, containers or re-covering items I had already made I have found my Scraptopia! Are you ready for a tour? Let’s go! My favourite thing about the room would have to be my desks. I love sitting at the desk on the left to scrap away then slide over to the desk on the right to look something up on the internet, chat with a friend via Facebook or edit photos for my blog. I also love how organised the room is and the feeling I get when I’m sitting in the room creating something and being able to relax as there is no clutter and I know exactly where everything is. I know there are a lot of people out there in the scrap world who have desks full of stuff with a small 30cm gap to scrap on but I can’t work like that. I like to know that everything is in it’s place and would prefer to spend my time scrapping rather than digging around to find stuff. Don’t get me wrong, my room can be a little messy at times but I won’t start a new project until I’ve cleaned up. A few of the things that have worked in my room the most are the custom items that I’ve added along the way. There are some products that I bought one or two of and before I knew it, had the whole collection. I blame Tim Holtz for this! I have his whole collection of Distress Inks, Distress Ink Refills and quite a few of the Distress Stickles, Paint Dabbers, Distress Stains – the list goes on! Being I use the Distress Inks quite often I wanted them to be close to my desk and organised in a way so that I didn’t have to mess around with them too much when I needed to use them. I came across a really talented man on the internet one day who made some really cool craft storage products and after a few months of drooling over them I decided that I was going to spoil myself and buy one! It was a really good decision as I have stored all of my Distress Inks in it and it sits right above my desk so I can reach up and grab whatever colour I need at the time. I have also placed a velcro dot on the bottom of each ink pad with an ink blending foam pad attached. This makes it so much easier to keep track of my foam pads and keeps everything together. The last step I took for this was to label all the Distress Inks and put them in the same order as Tim Holtz has on his colour guide as I have a copy of the colour guide with each colour filled in sitting close to my desk so when I match a colour for a project I am working on then all I need to do is reach up and get the colour I need and my ink blending tool from the right and I can start working with that colour. This is what I get to see when creating on my desk. My Distress Ink storage unit, my pretty Tinkerbell statues and my photo inspiration hanger. To the left of my desk is a drawer unit that holds lots of little bits and pieces and my TV sits on top. To the right is the little unit of jars that hold all my buttons. The beautiful lady sitting on top of them belonged to my Mum as did the little tiger egg that is under the TV. The little book that is next to the jar unit is the photo album that I store all my coloured copic images in until I figure out what project they will be used for. To the right of my desk within easy reach are my most used tools, a glass vase that holds all my double sided tapes and a layout stand with my favourite layout of my darling boyfriend sitting on it. The orchids that you can see in the vase were from my parents house. They were part of a flower arrangement vase type decoration that Mum used to keep on the dinner table until one of my nephews accidentally broke it one day. The vase they were sitting in smashed and she wasn’t able to fix it so she gave the flowers to me. Whenever I look at them they make me giggle as it makes me remember how many of her pretty ceramics that my sisters and I used to ‘accidentally’ break when we were little! Under the desk on the right side is where I store the tool kit that I take to scrap classes or when I’m going to a friend’s house to scrap. I also have my two Tim Holtz cases in here. One has all my Distress Stains, Alcohol Inks, Paint Dabbers, etc in it and the other has all of the trinkets from the Idealogy range. On the bottom shelf to the left is where I store all the Distress Ink Refills, my christmas embellishments box and paper trimmers. On the right I store paperwork items like instructions for tools, techniques, manuals and my spare cutting mats for when my friends come around to scrap with me. The desk on the right is where my laptop sits. At the back is a desk organiser that holds my Copic Refills, some journaling pens and mists then to the right of that is a little shelf that I keep my external hard drive, small camera, iPod and pretty pins on. 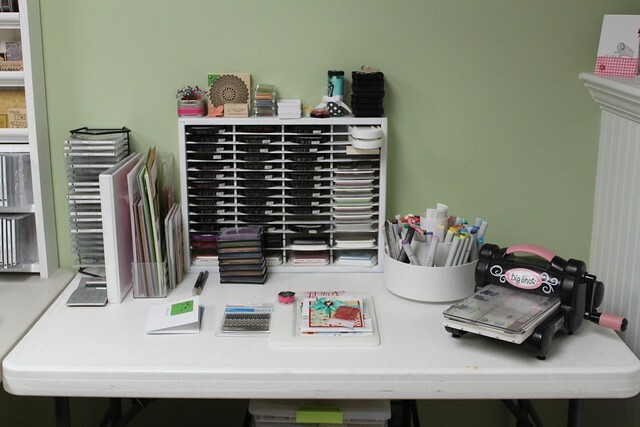 Check back tomorrow – I’m going to share details of how I organize specific products! It’s got a nice big top surface that comes in very handy, as well. 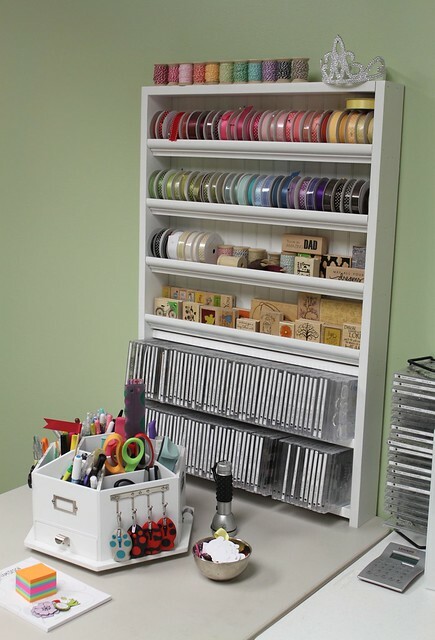 In the non-traditional sense, you can get creative with drawers for craft storage. I found these great ideas on the web. As you can see, the drawers don’t even have to be in a piece of furniture to be useful (& pretty) storage pieces. I hope these photos will inspire you to reconsider how to use drawers for storage in your space!